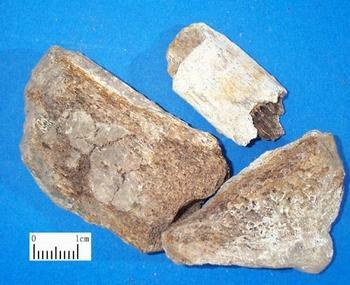 The ossature fossil of ancient times mammal. Shanxi, Henan provinces and Inner Mongolia Autonomous Region and so on in China. Dug in any time, but abided by rules. No bad smell, no taste. Best one is Wu Hua Long Gu which has strong hyposcopicity, yellowish white colour also with blue-grey and reddish brown figure inside, crispness and delamination. 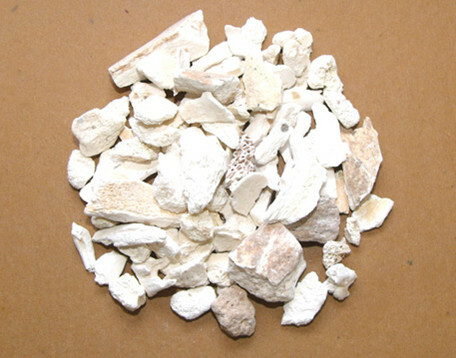 Removed impurity, stored in dry place; smashed; unprocessed or calcined. Sweet, astringent, neutral; liver, heart and kidney meridians entered. Induce sedation and tranquilization, pacify liver and subdue yang, arrest and astringe discharge. Being sweet and neutral in property and with heavy weight, it can induce sedation and tranquilization, so it is the key herb for settling tranquilization. It can be indicated for unsteadiness of heart-mind caused by various reasons. For unsteadiness of heart-mind, palpitation, fearful throbbing, insomnia and dream-disturbed sleep, it is often combined with tranquilizing herbs. For instance, it is combined with Suan Zao Ren and Hu Po and so on. For convulsive epilepsy, convulsions, mania-depressive psychosis and restlessness, it is often combined with phlegm-resolving, wind-extinguishing and spasm-stopping herbs. For instance, it is combined with Niu Huang, Dan Nan Xing and Gou Teng and so on. It enters liver and kidney meridians and has actions of pacifying liver and subduing yang. For dizziness, dizzy vision, irritability and tendency to angry, it is often combined with liver-pacifying and yang-subduing herbs, such as Mu Li and so on. For instance, it is combined with Mu Li, Bai Shao and Zhe Shi and so on in Zhen Gan Xi Feng Tang from Yi Xue Zhong Zhong Can Xi Lu. It is astringent in flavor and has good actions of astringing and arresting discharge. It is combined with herbs according to different syndromes. It is indicated for kinds of syndromes of incontinence due to healthy qi deficiency including seminal emission, spermatorrhea, frequent micturition, enuresis, metrorrhagia and metrostaxis, leukorrhea, spontaneous sweating, night sweating and so on. For seminal emission, spermatorrhea due to kidney deficiency, it is often combined with kidney-tonifying and essence-securing herbs. For instance, it is combined with Mu Li, Sha Yuan Zi and Qian Shi and so on. For frequent micturition due to heart and kidney deficiency, it is often combined with herbs to regulate and tonify heart and kidney and reduce urination. For instance, it is combined with Sang Piao Xiao, Gui Jia and Fu Shen and so on. For metrorrhagia and metrostaxis, leukorrhea due to qi deficiency with failure to control blood and insecurity of thoroughfare and conception vessels, it is often combined with qi-tonifying and astringent herbs to nourish qi and strengthen thoroughfare vessel, stop bleeding and stop leukorrhagia. For instance, it is combined with Huang Qi, Shan Zhu Yu and Hai Piao Xiao and so on. For spontaneous sweating due to qi deficiency or night sweat due to yin deficiency, it is often combined with qi-nourishing and yin-tonifying herbs and superficies-strengthening anhidrotic herbs. For spontaneous sweating due to heart-qi deficiency, it is often combined with Huang Qi and Wu Wei Zi and so on, such as in Huang Qi Tang. For yin deficiency with effulgent fire, insomnia, dream-disturbed sleep, palpitation, ight sweat due to yin-deficiency, it is often combined with Zhi Mu, Huang Bai and Xuan Shen and so on. It has actions of absorbing moisture, healing wound and promoting tissue regeneration after it is calcined for external application. It is often combined with same dose of Ku Fan in powder for local use. Decoct 15~30 g. Smash and decoct first. Take proper dose for external application. Use calcined herb for arresting and astringing discharge, absorbing moisture and healing sore. Lose unprocessed for otherwise.